Let's say you've never seen an inning of baseball, and you want to learn everything about the sport in just a few days. Where do you go? There are professional teams in hundreds of North American cities, but there's only one where you can absorb the whole spectrum of baseball experiences in one place: New York. Most cities have a single pro baseball team with a built-in regional support base. In St. Louis, everyone's a Cardinals fan—they're the only game in town. It's different in the five boroughs. With two current major league teams, two that left the City behind and two minor league clubs, different loyalties and traditions overlap on the same turf. How else, for example, could you account for the 2010 and 2012 World Series Champion San Francisco Giants bringing their trophy to Harlem, where many fans still retain an allegiance to the former New York Giants? Although the City's ballparks are new (they've all opened since 2001), they retain and reflect more than a century of baseball history—and they're all a short, easy trip from Manhattan by public transit. With 27 championships—by far the most in baseball—this distinguished franchise rouses strong feelings from rooters and rivals alike. A Yankees game is a sporting event, but, for some, it also stirs feelings of awe and reverence. The previous Yankee Stadium was built in 1923 (the year the team won its first World Series), and the new structure's grand entrance pays homage to the original architecture. Inside, a replica of the iconic frieze that was removed from the old stadium in the '70s (when it was renovated) now circles the grandstand. Any seat in Yankee Stadium is nice, but the most legendary perch is in the outfield bleachers—a relative bargain at $18–$23. "If I can help it at all, I will go to the bleachers," says blogger Joe Pawlikowski, a seasoned Yankees fan whose site, River Avenue Blues, offers constant commentary on all aspects of the Bronx Bombers. What you lose in lumbar support sitting on these backless benches, you'll gain in intensity. The most dedicated fans, the so-called "Bleacher Creatures," sit together in Section 203. At the start of a game, their "roll call" involves chanting Yankees players' names until their heroes acknowledge them. As for the other team—well, they sometimes get more colorful greetings. (Do yourself a favor and leave your favorite team's cap at home—unless you're a Yankees fan, that is.) If you're bringing a kid to the game, you might want to sit elsewhere. If not, you may well enjoy hearing the fans' innovative taunts toward the opposing right fielder. Pawlikowski says it's largely this mix of fans that makes Yankee Stadium special. The Yankees "have more fans than anyone in the game. That comes mostly from the casual fans, but they also blend in the really knowledgeable fans. You might hear more casual talk on the field level, but if you go up to the bleachers, those guys know baseball." He also recommends arriving early and checking out the stadium's on-site museum, which features memorabilia valued at more than $10 million, including signed baseballs from an ever-increasing number of Yankees (the team wants to gather one from each of the more than 1,400 players to ever don pinstripes). The gallery showcases the old locker of catcher and onetime American League Most Valuable Player Thurman Munson, who died in a 1979 plane crash. And in an outdoor plaza past the center-field wall, Monument Park holds an inspiring collection of tributes to the team's legends—Babe Ruth, Yogi Berra, Reggie Jackson and others. Born in the swingin' 1960s as heirs to NYC's National League tradition, the Mets inherited orphaned rooters and an underdog spirit from the New York Giants and the long-suffering Brooklyn Dodgers, both of whom had moved to the West Coast. The main gate of the Mets' home ballpark, Citi Field, was inspired by the entryway that greeted fans at the Brooklyn Dodgers' old home, Ebbets Field (long since razed to make way for apartments). Named the Jackie Robinson Rotunda after the first African-American major leaguer, the space is defined by soaring 70-foot archways that let natural light flood the lobby. Inside, the cozy park seats fewer than 42,000. It's packed with benches, tables and other nooks where rooters can sit down with a hot dog, relax and take in the sights and sounds of a summer day. Fans homesick for the Mets' previous residence, Shea Stadium, can visit its old home-run apple outside of the Jackie Robinson Rotunda. The gargantuan plaster fruit, located behind Shea's outfield wall, would emerge from a top hat when players went deep. A new version now sits behind Citi's center field wall, and is just one lighthearted staple of Met fandom. Another is the team's baseball-headed spokesperson, Mr. Met, the first live mascot in major league history: a little wacky and always optimistic. In recent years, his wife, Mrs. Met, has returned to action as well. Eric Simon, who writes about the Mets on the blog Amazin' Avenue, sums up the New York baseball-fan experience as "a trade-off between the assurance of moderate happiness [while rooting for the historically dominant Yankees] and the potential for unbridled ecstasy [should the Mets win a championship]." Mets fans first got to know the team through astounding ineptitude (the 1962 Mets lost 120 games, a record that still stands), and the team's two World Series wins resulted in jubilant disbelief—in 1969, when the Mets had never before notched a winning season, and in 1986, when they were down to their last strike before an improbable rally against the Boston Red Sox. That's one reason many fans have adopted the semi-spiritual rallying cry "You Gotta Believe," coined by pitcher Tug McGraw during the 1973 season. One final, but not unimportant, note: Citi Field is the only place in NYC where you'll see the pitcher hit. In most minor league games and in the American League, a designated hitter (DH) takes the pitcher's place on offense, but the National League never adopted the DH rule. Pitchers are usually (but not always) poor hitters, and their batting introduces different wrinkles to baseball strategy. Cities throughout America feature ballparks with waterfront views, but there are those who will tell you that the Staten Island Yankees have the best of all with their vantage point on New York Harbor and the City's skyline beyond their outfield wall. The easiest way to arrive in the borough is by ferry, which is not only free, but also takes you right to the ballpark—and offers views of the Statue of Liberty and the rest of the New York skyline on the ride. The game you'll find on the other side isn't much different from what it was a century ago, and the Staten Island Yankees are focused on cultivating close relationships with their fans, the type that some see as a charming relic of a bygone era. Richmond County Bank Ballpark also pays tribute to scouting, a part of the game that rarely makes headlines. The park includes the Professional Baseball Scouts Wall of Fame, with plaques commemorating professionals who spotted and believed in star baseball talent before anyone else. It's a fitting touch for the Baby Bombers' park, the first pro home for such standouts as Robinson Cano and Chien-Ming Wang. 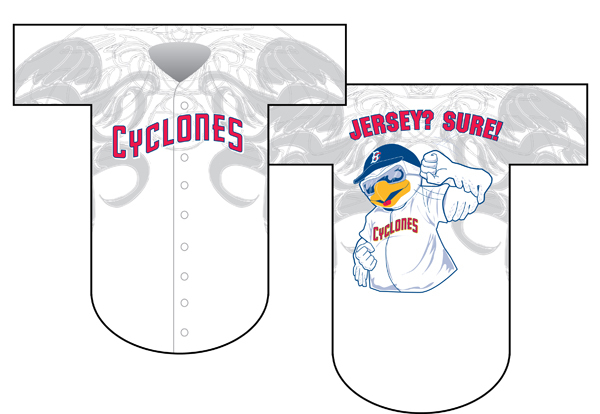 The Cyclones fuse two proud baseball traditions into one family- and community-friendly whole. First, they honor their borough's history in the sport. Outside MCU Park, a statue of Brooklyn Dodgers Jackie Robinson and Pee Wee Reese celebrates the pioneering player and a teammate who stood by him in the face of discrimination. An on-site museum, the Brooklyn Baseball Gallery (open on game days, with $1 admission), chronicles the achievements of the Cyclones and their predecessors, the Dodgers and the Atlantics. The team's retired numbers include those worn by both Cyclones and Dodgers, continuing the Cyclones' role as stewards of Brooklyn baseball heritage. Still, if the Staten Island Yanks push the envelope on free food and other such benefits, the Cyclones set the bar for sheer wackiness. In the past, they've offered free tickets for life to anyone who would agree to name their child "Brooklyn" or "Cy," and their staff has played 24 consecutive hours of baseball—seriously—for charity. In 2010, for example, they built a day around the TV show Jersey Shore (complete with uniforms that looked like Ed Hardy T-shirts, not to mention free hairstyling and dugout dance battles). More whimsical stunts are sure to follow this year. The Cyclones are a perfect fit for the amusement district they call home. "When I think about Brooklyn and Coney Island, I think of the Cyclones," says Johnson. And they're not far from Luna Park, the Wonder Wheel or the team's namesake roller coaster, all open during baseball season.